Firecrackers are normally ignited by using a matchstick or a candle. You have to run away quickly after igniting the fuse of the firecracker. This method of igniting firecracker is unsafe, because the danger of the firecracker bursting before you reach a safe distance is always there. The device described here uses remote control, usually used with TV receivers or CD players, to burst the firecracker. 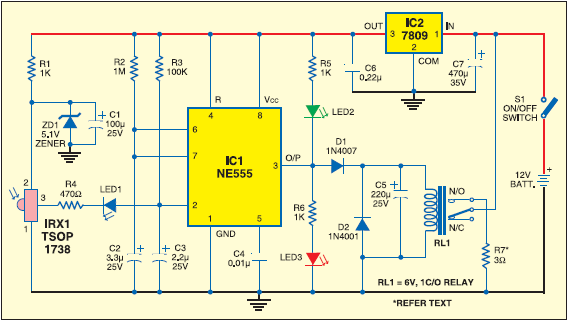 Thus the firecracker can be ignited from a safe distance using the circuit described below in conjunction with the remote control. In the figure shown here, normally the output of IC1 is low and green LED2 is ‘on’ and the red LED3 ‘off.’ This indicates that the circuit is ready for use. When any key on the remote control is pressed, output pin3 of IRX1 (IR receiver module TSOP1738) goes low. This output is connected to pin 2 of IC1 via LED1 and resistor R4 to trigger the monostable operation of IC1. firecracker is about to burst. R7 is a small part of the element of an electric heater (220V, 1000W), which is kept away from the electronic circuit and connected to the relay contacts through a thick electric cable. The resistance value of short length of the heater element (R7) is 3 to 3.5 ohms. A current of around 4 amperes flows through it when connected to a 12V battery. Flow of 4A current through R7 for 3.5 seconds makes it red hot, which ignites the firecracker. cabinet to prevent it from being damaged by bursting of the firecracker. The IR receiver and the two LEDs should be fixed on the front panel of the cabinet. Wiring and relay used in the circuit should be chosen such that they are able to carry more than 5 amperes of current.